The WIA Bookshop is now taking orders for the ‘Wireless Men and Women at War’ publication that details the history of wireless communications before World War I, and in later years and conflicts. The price is $29.95 plus postage for members and $35 for non-members, plus postage. WIA Historian Peter Wolfenden VK3RV has fully researched the content. Together with numerous additional contributors, the WIA Board fully supports this timely record of history as a must read volume. An inspired experimenter and leader: Walter Hannam – his part of the jigsaw! Stories from Centenary activation events. Plus many more articles previously published in Amateur Radio magazine and several new stories. The WIA Publications Committee is proud to make it available and after printing the book will be a mail order item from the WIA Bookshop. To secure your limited edition copy, visit the WIA website via this Link. Be sure to let others know of its availability. 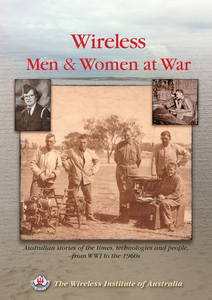 A campaign has begun seeking a wider market for the publication, including libraries, RSL clubs, and those with an interest of this historical subject.